Great place and great value for money. Great location, clean, apartment has everything you need for the short stay. - Habitat Apartments reply: Hello Vismantas, thank you for your comments and compliments. We are all pleased that you have enjoyed your stay with us. We are looking forward to welcoming you back to our Apartment. Thank you! Only one negative point : The people in the others apartments were very noisy in the stairs and in their apartements. The apartment ADN 12 is located in Sants area. Metro stop - 174 m.
Metro stop - 293 m.
Plaza de España - 0.35 km. Fira de Barcelona - 0.47 km. Foundation of Joan Miró - 1.61 km. Great location, well appointed apartment. Great apartment, near metro station and market. Many restaurants around and more in a few minutes walk. We enjoyed our stay. Vicino alla metropolitana ed a pochi passi da piazza di Spagna dove c'è la fermata dell'Aerobus che collega Barcellona all'aereoporto, l'appartamento è molto tranquillo, pulito ed adatto per una visita di qualche giorno alla città. Dotato di ogni comfort incluso wifi, aria condizionata e lavastoviglie. You need to repair noise isolation between room and sewage pipes. Habitat comments: We are glad to see that you enjoy your stay and many thanks about your remark concerning the isolation, we will do our best to fix it in order to avoid the similar situation in the future. Thank you. We loved the location of the apartment easy walking distance to the magic fountain and football stadium. Metro stop on the corner to go further a field. Friendly local shops bars and restaurants at really reasonable prices. Greeted by representative at the apartment who was most helpful. Perfect location to stay in Barcelona! You will save lot of time and EUR on public transportation as lot of tourist attractions are within walking distance. The apartment has all you need. Spacious and secured. They even have a service to take your luggage to the airport. Quiet and comfortable apartment with terrace in Barcelona. 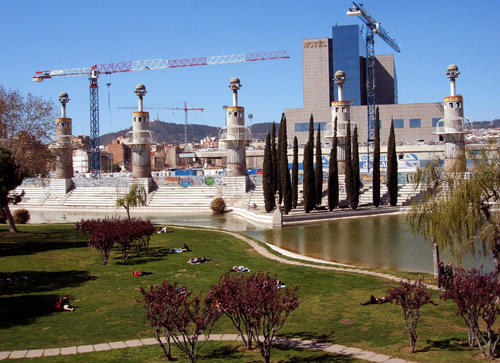 Located in Sants district, next to Plaza España. A place to relax with easy access to public transportation. It can comfortably accommodate 4 people.